The NFL Championship game on December 27, 1953 featured a rematch of the previous year’s participants, the Detroit Lions and Cleveland Browns. The Lions won that contest and were looking to repeat as champions against the Cleveland team that was now appearing in its eighth straight title game (four in the All-America Football Conference, four in the NFL). 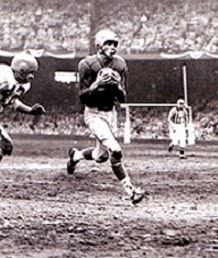 Detroit, coached by Buddy Parker, still featured fiery QB Bobby Layne (pictured above) surrounded by a capable group on offense and a rugged defense, and had added outstanding rookies that included tackles Charlie Ane and Ollie Spencer plus G Harley Sewell on offense and LB Joe Schmidt on defense. The Lions went 10-2 in winning the Western Conference, including victories in their last six contests. The Browns, under the guidance of the innovative Paul Brown, had new ownership but continued to win with an almost machine-like consistency. QB Otto Graham remained the key to the offense, and while star end Mac Speedie defected to Canada, end Dante Lavelli was still available and two second-year players, end Pete Brewster and HB Ray Renfro, picked up the slack. 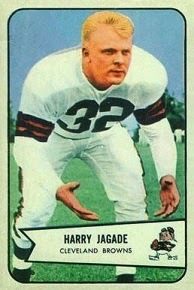 FB Harry "Chick" Jagade was the successor to the fading Marion Motley and the defense gave up the fewest points in the league (162). Star MG Bill Willis was back in action, having missed the previous month due to injury. Cleveland topped the Eastern Conference with an 11-1 record, not losing until the season finale when they had already wrapped up first place. Despite losing to the Lions the previous year, the Browns were the favorites coming into the rematch. There were 54,577 fans in attendance at Briggs Stadium, where the field was slippery in some spots. In the first play from scrimmage, the Browns were penalized back to their 19 yard line. Following a carry by Chick Jagade, LB LaVern Torgeson forced Otto Graham to fumble and MG Les Bingaman recovered for the Lions at the Cleveland 12. Detroit kept the ball on the ground, with Bobby Layne converting a fourth-and-one situation via a quarterback sneak and, after HB Bob “Hunchy” Hoernschemeyer gained nothing, HB Doak Walker dove for a touchdown from one yard out and then kicked the extra point. With the help of a penalty, the Browns had good field position near midfield to start their next series. However, Graham overthrew an open receiver on a third down play and Cleveland had to punt. 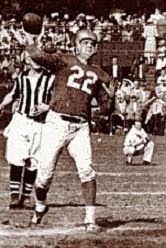 The Lions lost star end Leon Hart with a knee injury and Jim Doran (pictured below), who normally played on defense and had caught only six passes all year, took his place. Doran made his presence known by making a catch for a gain of 27 yards, but after reaching the Cleveland 46, Detroit had to punt, as did Cleveland again in turn. The Browns got a break on defense late in the opening period when DE Len Ford recovered a fumble by Hoernschemeyer at the Detroit six. The Lions didn’t let down on defense, but in the first play of the second quarter, the Browns came close to a TD when Dante Lavelli dropped a pass in the end zone. Lou Groza kicked a 13-yard field goal to make the score 7-3. The Lions punted again following their next series but got the ball back when HB Dub Jones fumbled and DE Sherwin Gandee recovered at the Cleveland 25. Detroit couldn’t take advantage of the turnover, as Layne was sacked for a loss of 12 yards on third down and Walker was wide to the left on a 45-yard field goal attempt. The teams exchanged punts and then interceptions. DHB Jim David picked off a Graham pass and returned it to the Cleveland 20, which set up the next Detroit score. The Lions came close to a touchdown on a trick play when Layne threw a lateral to Walker, who ran to his right, drawing the defense, and then passed it back to Layne for an apparent TD. However, the play was nullified by a 15-yard penalty and Walker ended up kicking a field goal from 23 yards. With 1:15 left in the first half, QB George Ratterman came in for Graham after Jagade returned the kickoff 29 yards to the Cleveland 49. Ratterman was sacked for a 13-yard loss but also completed a screen pass to Jagade for 19 yards to the Detroit 44. As the seconds ticked away, Groza attempted a 51-yard field goal, but it missed and the score remained 10-3 in favor of the Lions at halftime. On Cleveland’s first possession of the third quarter following an interception by safety Ken Gorgal, the Browns advanced 51 yards in eight plays. Jagade ran nine yards off tackle for a TD and Groza’s conversion tied the score at 10-10. Such remained the situation until, in a series that extended into the fourth quarter, the Browns moved the ball effectively and Groza booted another field goal, this time from 15 yards, to put the visitors in front by 13-10. Detroit followed up with a 14-play possession that reached the Cleveland 26. Layne completed passes to ends Dorne Dibble and Cloyce Box and ran the ball three times himself, but the Lions came up empty when Walker missed a field goal try from 33 yards. With Jagade running well, the Browns advanced from their 20 to the Detroit 33. Groza kicked a 43-yard field goal and the visitors were further ahead by 16-10. The situation was looking dire for the Lions as they got the ball with four minutes remaining to play and down by six points. But Layne directed the home team on an 80-yard drive in which he completed three passes to Doran. The first came on the initial play of the series and picked up 17 yards, the second converted a third-and-10 situation with an 18-yard gain, and the last was on a perfect pass from Layne after the receiver had sprinted past DHB Warren Lahr into the end zone, making the catch for a 33-yard touchdown. Walker (pictured below) added the all-important extra point to put Detroit in the lead with the clock now down to 2:08. On the ensuing series, rookie DB Carl Karilivacz intercepted a hurried Graham toss to seal the 17-16 win for the Lions. Several fights broke out in the remaining time and Detroit’s Dibble was ejected. The Lions led in total yards (293 to 191), almost completely grounding Cleveland’s vaunted passing attack (nine net yards), and had the edge in first downs also (18 to 11). Each team turned the ball over four times. Bobby Layne completed 12 of 25 passes for 179 yards and a touchdown while being intercepted twice. He also rushed for 44 yards on 9 carries. Jim Doran had an outstanding performance as he caught four passes for 95 yards and scored the game-deciding TD (he had none during the regular season). Cloyce Box also had four catches, for 54 yards. Bob Hoernschemeyer rushed for 51 yards on 17 carries. Otto Graham had an uncharacteristically dreadful performance in which he was successful on just two of 15 throws for 20 yards with no TDs while giving up two interceptions. George Ratterman completed his only pass for 18 yards. Chick Jagade gained 102 yards on 15 rushing attempts that included a score and also had one pass reception for 18 yards, which made him Cleveland’s most productive receiver as well as top rusher. Lou Groza was successful on three of four field goal attempts, tying the then-NFL championship game record. As strong as the Browns were, the once-invincible team had now become the first in NFL history to lose three consecutive title games. 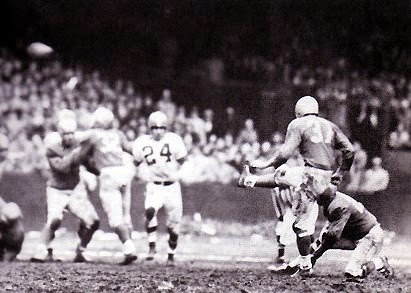 The clubs met for a third time in the 1954 Championship game, and this time Cleveland thrashed the Lions, gaining a measure of revenge and ending Detroit’s hopes of topping the NFL for a third straight year.